With by far the largest number of local governments in the nation, the Civic Federation has long advocated for a sensible approach to consolidation and collaboration to reduce the number of local governments in Illinois and improve their effectiveness and efficiency. Consolidation of local governments in Illinois is a Civic Federation legislative priority. The purpose of this blog is to summarize the number and types of local governments in Cook County and its five collar counties: DuPage, Kane, Lake, McHenry, and Will counties. This is part of a larger research effort on the part of the Civic Federation to develop an inventory of all local governments in Illinois. It is the Federation’s hope that providing an inventory of local government units will help demonstrate both the sheer volume of local governments in the State and facilitate renewed efforts toward consolidation and intergovernmental cooperation. The vast number of local governments is often cited as a driving factor for Illinois’ high property tax rate, one of the highest in the nation, as many of these local government are primarily funded by property taxes. However, the total number of local governments reported varies based on the source and methodology used by the reporting agency. The U.S. Census Bureau’s 2012 Census of Governments tallies Illinois’ local governments units at 6,963. The State of Illinois Comptroller lists a total of 8,516 local governments as of May 2016. The most recent data available from the Illinois Department of Revenue lists the total number of local government at 6,038 as of 2015. Cook County and its collar counties are a microcosm of Illinois’ multiplicity of local governments. Of the 102 counties in Illinois, the six counties in northeastern Illinois contain nearly 1,300 local government units, or approximately 15% of the State’s total, according to data provided on the Illinois Comptroller’s website. Recent legislative actions have enabled more local government consolidation. DuPage County’s ACT initiative was recently expanded to include McHenry and Lake Counties and Senate Bill 3 was signed into law on August 14, 2017 as Public Act 100-0107. Public Act 100-0107 grants all 102 Counties in Illinois the same powers previously granted to DuPage, Lake and McHenry counties. It also allows for the consolidation of township governments, allows for townships to take over the duties of certain road districts, removes the cap on the size of a township’s land area and allows for voters to abolish townships that are coterminous with a municipality. You can read more about government consolidation legislation that was recently signed into law here. 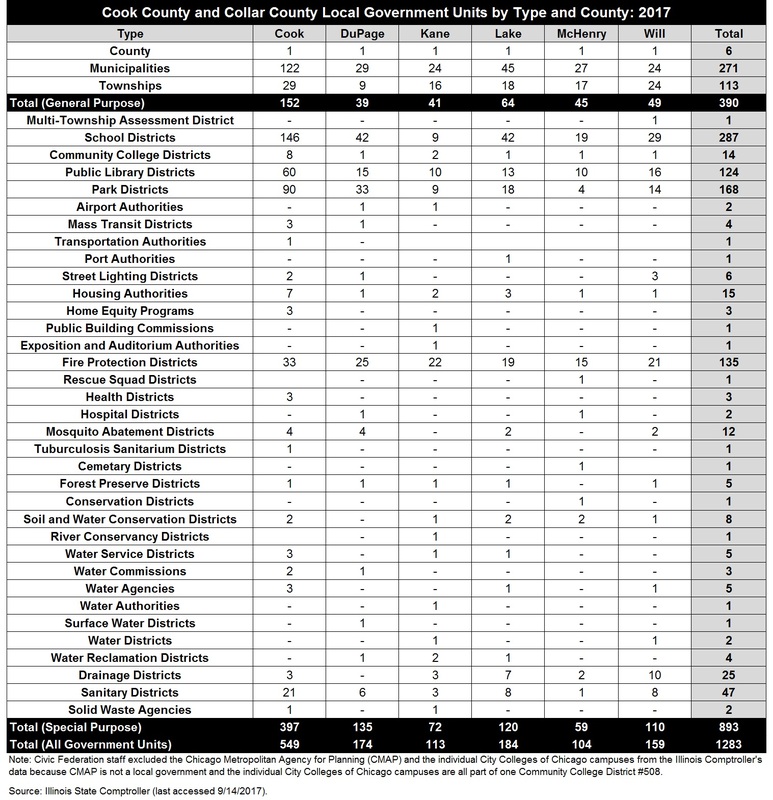 Based on data from the Illinois State Comptroller’s website, the following table lays out the number and type of local governments in Cook County and each of the collar counties. It should be noted that no list of governments in Illinois is exhaustive, due to the methodological choices made by the agency doing the reporting and the sheer number of governments to count, so some units of government may be unaccounted for in this list. For example, the Comptroller’s data does not include the Illinois International Port District, which is located in Cook County. It is also important to note that the Comptroller’s data still includes Evanston Township in its list of local governments and is accounted for in this list, even though it was dissolved by the Evanston electorate in 2014 via referendum. A total of 390 of the local governments in the northeastern Illinois region are general purpose units of government, or local governments that serve multiple functions and perform various services within the community. General purpose governments include counties, municipalities and townships. The remaining 893 local governments are special purpose units of government. These special purpose units of government perform certain limited functions, such as recreation, preservation, fire protection, education, transportation and mosquito abatement, among others. A forthcoming Civic Federation report will provide a comprehensive inventory of all local governments in Illinois.